A small change in the image brightness should be displayed as an equivalently small change in brightness. 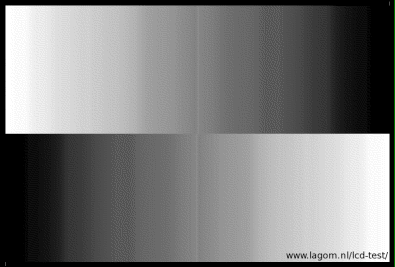 The greyscale gradients should be displayed smoothly without any bands, lines, or colors showing up. Also watch whether there isn't too much noise in the darker parts. TFT screens usually use dithering to reproduce darker tones, which will show up as static or moving patterns (see Black test). If you try to improve the display of the previous tests (with either monitor settings or video card settings) you might get more banding here. In that case: bad luck, you can't have it all. With computer-generated images (games and gradient desktop backgrounds), banding is more likely to be a problem than with photographic images. 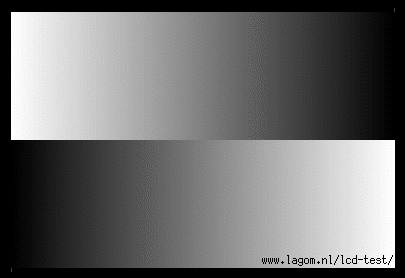 The gradients should show up as completely smooth transitions from deep black to bright white, like this, but without the dithering. A bad monitor (or less likely a bad video card) will show something like the image below. 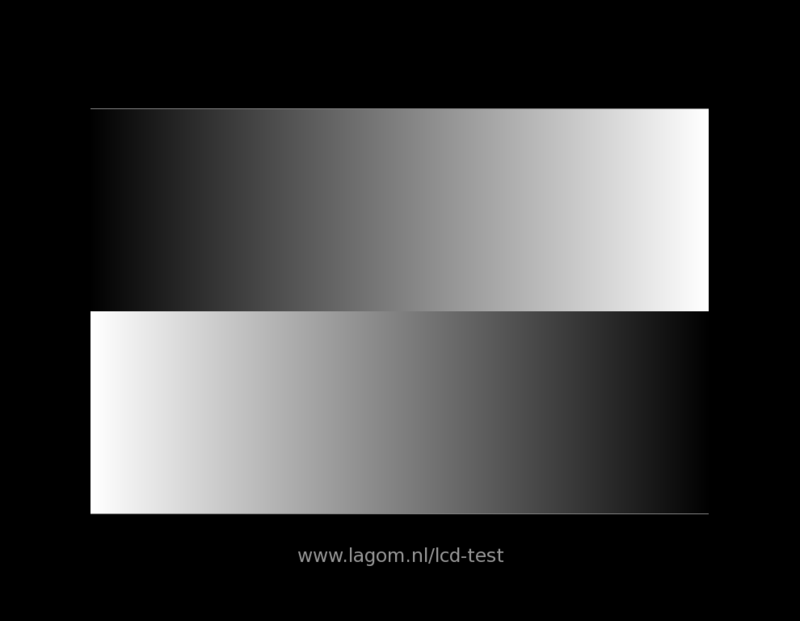 Lines and bands show up, and moreover, the darker part of the gradient has become indistinguishable from the black background. If your computer is set to 16-bit color (also called Highcolor or Thousands of colors) rather than 24-bit color (Truecolor or Millions of colors), it might look like the image below, with 32 clearly distinguishable bands. Possibly, every other band could be greenish if you have true 16-bit color rather than 15-bit color. If it looks like this, it most likely not the fault of your monitor but rather a limitation of your video card or wrong video-card settings. However, if your computer does use 16-bit color, but it does not look like the image above, it means that your image viewer uses dithering, which renders these tests less useful. Better use a dumb image viewer (Internet Explorer would be fine) in such cases.